Marion Butler, 1863-1938 and Cyrus Thompson, 1855-1930 Addresses of Marion Butler, President, and Cyrus Thompson, Lecturer, to the North Carolina Farmers' State Alliance, at Greensboro, N.C., Aug. 8, 9, and 10, 1893, at its Seventh Annual Session. 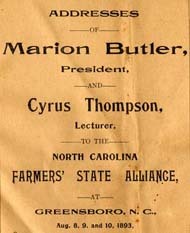 Addresses of Marion Butler, President, and Cyrus Thompson, Lecturer, to the North Carolina Farmers' State Alliance, at Greensboro, N.C., Aug. 8, 9, and 10, 1893, at its Seventh Annual Session. Raleigh, N.C.: Barnes Bros., 1893. Political participation -- North Carolina.